In most organizations, recruiting is relatively straightforward: a hiring manager gets budget to add headcount to their team, work with their recruiters to craft a perfect job title and description, and recruitment takes over the search for looking for the perfect candidate to fill the role. High volume recruiting, on the other hand, is a whole different ball game. When the foundation of your recruitment needs is driving quantity (and then, of course, screening for quality), the approach you have to take in order to drive that volume is much different than the approach of a recruiter looking to fill a single role. Below, we’ve outlined 10 do’s and don’t of high volume recruiting to help you ensure that your practices are fine-tuned so you can continue to deliver the right quantity of quality candidates for the needs and goals of your organization. ❌ Don’t: Treat every open job the same. One of the biggest mistakes an organization can make, especially when it comes high volume recruiting, is treating all of their open jobs the same. No two jobs are created equal; each of your roles are unique, and you’ll need to adapt your strategy based on job criteria, where you’re hiring, what the unemployment market is like, and more. All of these factors will play a role in how effective your recruiting is. While it is important to think about your strategy holistically, the devil is in the details. Spend time digging into the data on your hiring performance history across job markets and job types, and set your own benchmarks. ✔️ Do: Define and set an apply goal for each open job. An apply goal is the average number of candidates, based on your historical hiring data, that you need to drive for each open role to achieve a hire. Typically, this number will vary by employer, job type, location, and hiring manager requirements. For example, you may need 40 applicants to generate a hire for a nursing position in Wyoming, while you may only require 10 in New York. Defining your apply goal for each open job is a foundational metric you will need as you begin to optimize your high volume recruiting performance. Setting it effectively will enable you to identify when to stop spending on the jobs that already have enough applicants, therefore creating two opportunities: the availability of extra budget to advertise your other jobs, and a better candidate experience from eliminating applicants you don’t have time to disposition. ❌ Don’t: Recruit just anyone, regardless of how qualified they are. Sometimes, job seekers will submit applications for roles when they have limited experience in the required field, don’t meet a majority of the hiring criteria, or don’t have the formal training that the role depends on. When this happens, it’s important to take a step back and assess the situation. Does the candidate fall short of only one or two of the required skills or experiences? Or, is their past experience so different from what the hiring manager asked for, you’re confused about how they found and chose to apply for one of your roles? If it’s the latter, it’s important to stay true to the job description and disposition the candidate. When it comes to high volume recruiting, quality (instead of just quantity) should still play a part in the decision-making process. Make sure you also spend time assessing whether the candidate may have applied to your open role because your job title or description are ambiguous. This could be an indication that you need to make some tweaks, particularly if there are any trends in your “non-qualified” candidates. Need to face the high volume recruiting mountain in 2019 head-on? Gain expert tips for scaling your strategy to meet your business goals and get the headcount you need in our latest webinar with ERE: Facing the Mountain – High Volume Recruiting in 2019. ✔️ Do: Stop advertising jobs that have enough applicants. Recruitment advertising is an integral part of executing a volume hiring strategy. It provides your company exposure to job seekers you would otherwise never reach, thus broadening your talent pool and putting your open roles at the top of search results. Going back to setting an apply goal for each of your jobs, this data is vital to know for future decision-making about how to optimize your advertising and spread your recruiting dollars as far as they will go. Think back to the hiring example we mentioned early: you need 40 applicants to generate a hire for a nursing position in Wyoming, but only need 10 for the same type of position in New York. Now, let’s say a hospital in New York has major turnover, and hundreds of nurses will be looking for new employment. If you’re still sponsoring your nursing positions in New York, and already have the 10 applicants you need to fill each one, each click from those hundreds of nurses now looking for a new role will eat up the rest of your budget. Now, you’re left with little to no advertising budget left, and you only have a dozen or so applicants for your roles in Wyoming. To avoid getting in this sticky situation, it’s vital to use advertising software that lets you set apply goals for each jobs, and trigger rules-based decisions that will automatically stop spending your New York budget at 10 applies, so it can be reallocated to your roles in Wyoming. ❌ Don’t: Rely on only one or two sources to generate applicants. Today, there are hundreds of places around the Internet for job seekers to conduct their job search. From big name job boards, to social media platforms, to niche career sites in their industry, the possibilities are nearly endless. So, with all of these potential avenues to drive candidate traffic, limiting yourself to only a few is a mistake. High volume recruiting requires reach beyond just the big players (though getting your jobs seen on their sites is still important, of course). But if you need to hire dozens or hundreds of candidates each month, relying on only a few sites to generate your traffic won’t deliver. The more sites you bring into your network, the further your job reach can go. But keep in mind: it’s important to pay attention to your sources, and re-evaluate on at least a quarterly basis. That way, you can weed out the sources that are underperforming, and double-down on the ones that are driving the volume you need. ✔️ Do: Segment jobs by location, and monitor performance. Hiring practices can, and should, vary by state. After all, recruiting in more rural areas, especially when you have a large quantity of jobs that need to be filled, is always going to be more difficult that recruiting in more urban and populated states. And if you want to be successful in meeting your organization’s goals, you’ll need to keep an eye on the numbers. Before you kick off your recruiting strategy, look at the unemployment rates of every state in which you plan to recruit. 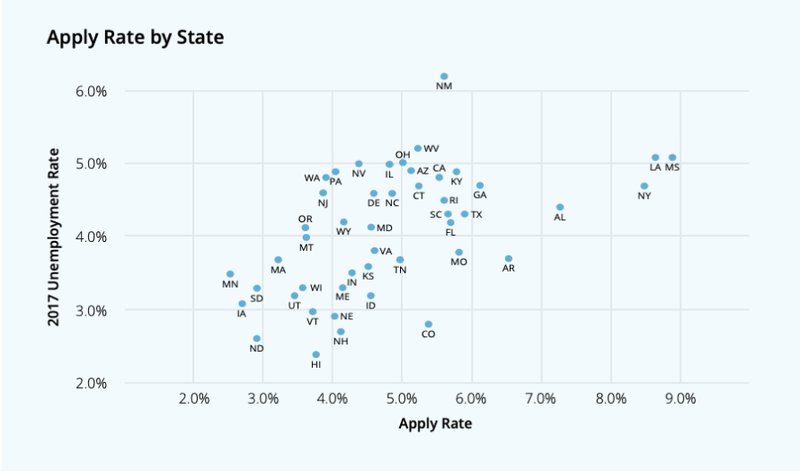 Our data has found that there is a noticeable correlation between state-level apply rates and unemployment rates. It makes sense – if the unemployment rates are low, less people will be actively seeking employment. Use that data as you plan your campaign. If you know you have dozens of roles to fill in a state with low unemployment, expect that competition for those candidates will be much stiffer, and allocate your budget and efforts accordingly. ❌ Don’t: Forget about your employer brand. Now, we’ve spent a lot of time talking about using advertising in your high volume recruiting strategy. But that doesn’t mean that we should put employer brand on the backburner. Candidates still need to visit your website, learn more about you, and ultimately decide if your company is one that they would like to work for. Make sure your Corporate Careers Site is up-to-date, with employee testimonials, photos, and videos. Showcase your organization’s values, mission, and what makes working for you unique. If you have a comprehensive benefits package, this is a great place to share that information as well. A well-maintained employer brand could be the difference between someone choosing to apply for one of your open jobs – it’s worth the investment. ✔️ Do: Measure your recruitment sources against the same metrics. When you start to run multiple high volume recruitment campaigns across different sources, the data you receive back from your job sites may appear slanted; metrics such as cost-per-applicant, apply time, cost-per-click, and more. Knowing this, it becomes particularly challenging to run comparison reports across all your sources with the increasing number of types of performance models available to recruiters. To understand your performance media from various sources accurately, start by separating out your free sources from your paid sources. Free is free. It’s important to not let free traffic confuse the success metrics from the real budget you are pouring into the market to generate candidates for your jobs. 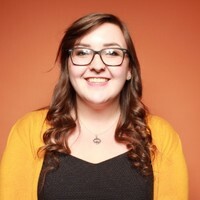 Then, from your paid performance media sources, regardless of if you are buying per click, apply click, or applicant, you should choose a common metric and run the math so that you’re measuring all your sites on the same performance metric. Ideally, you will want to measure performance as close to a hire as possible. With an even playing field, you can start to implement changes to your job advertising strategy that will impact your overall performance across all your sources. Employers would put their ad in the local paper, and simply wait for candidates to come rolling in with their resumes. It was that simple – and, that risky. The days of “post and pray” are long gone. Nowadays, you need to be using technology to your advantage. Create a compelling job listing, and utilize technology that will show your job in the right place, at the right time, and to the right candidates. Using your own recruitment benchmarks, you’ll be able to clearly understand the volume you need to fill each role, optimize your budget, and generate quality candidates. ✔️ Do: Use automation software to adjust your bids & optimize performance. The time, cost, and human error associated with manual bidding in job advertising is inevitable. To avoid costly manual mistakes, it’s important to find a solution that allows you to scale your bidding strategy and deliver the candidate volume you need to each and every requisition. Making real-time micro changes to bidding strategies to keep up with an ever-changing marketplace that can greatly impact output. By using performance job advertising software, you will be able to start optimizing your media for lower cost and, most importantly, better volume. Software like Appcast solves for the billions of dollars in wasted spend in today’s recruiting landscape and simply makes job ads work. Through automation, the advanced algorithms leverage programmatic, rules-based ad buying to identify, sponsor, and increase quality traffic to your jobs – importantly, only the jobs that need more applicants while automatically un-sponsoring the ones that already have enough. Discover the data behind candidate attraction and conversion rates with our Recruitment Media Benchmarks.